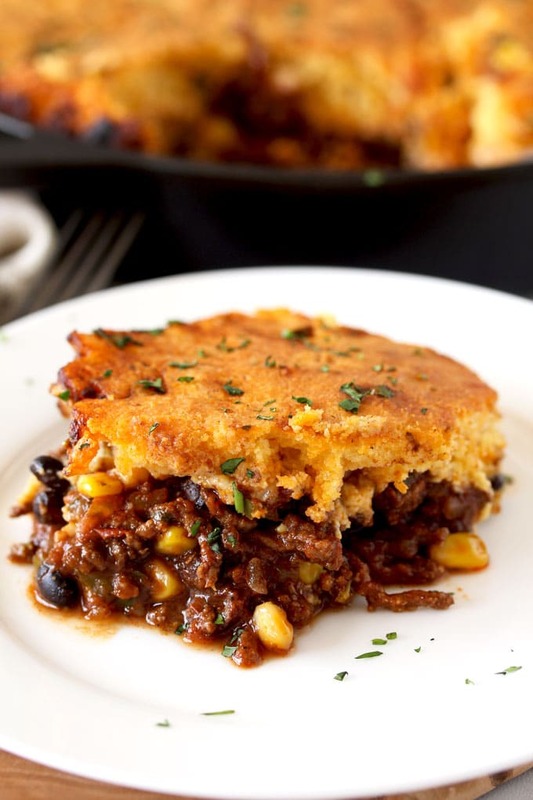 This Tamale Pie is loaded with tasty and hearty ground beef chili that seeps through a delicious homemade brown butter cornbread topping. 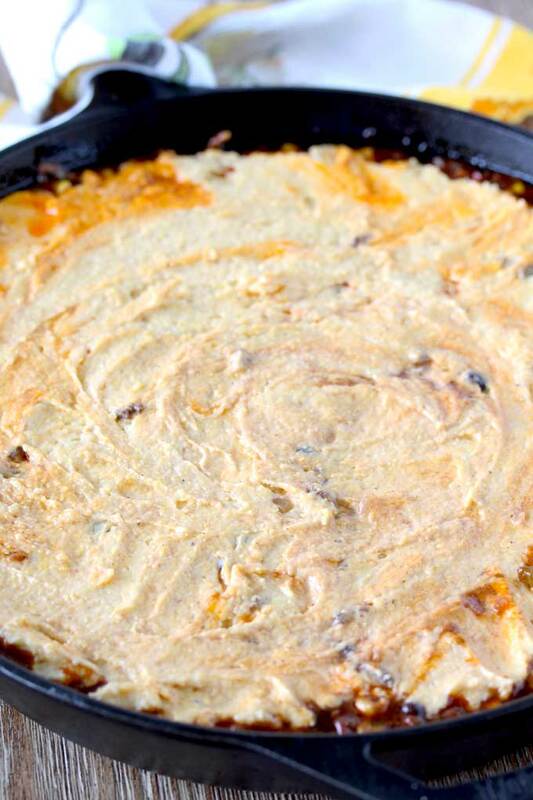 This easy tamale pie recipe is cooked in one skillet and is bursting with layers of flavor! Ground beef casserole recipes are the ultimate comfort food! 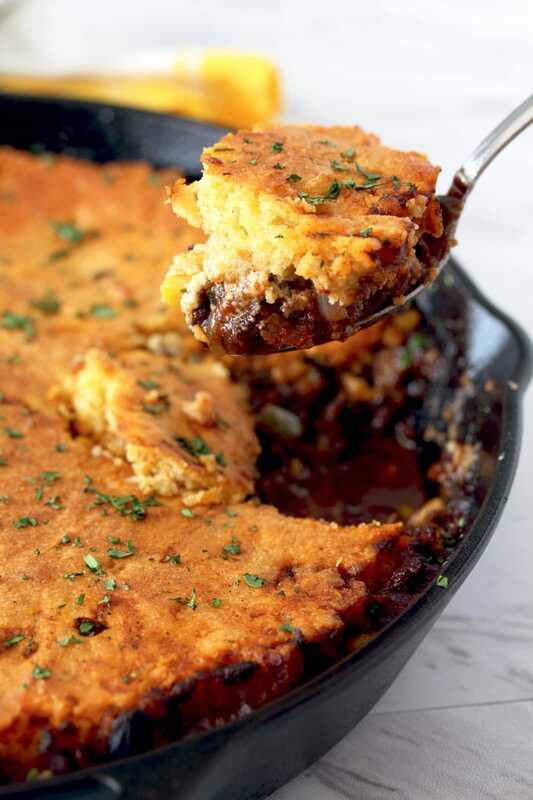 This hearty one skillet Cornbread Tamale Pie is packed with all sorts of Tex Mex flavors. The homemade cornbread topping is tender, a bit sweet and the browned butter takes it to the next level of yum! 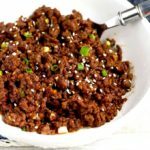 This ground beef casserole is an easy and budget friendly meal your family and friends will love. Brown hamburger meat with onions, garlic and green peppers. Add the spices, tomatoes, salsa (store bought or homemade) and let it simmer. Finish it up with corn, black beans and fresh cilantro (you can skip the cilantro if you are not a fan). To make the brown butter, melt the butter in a skillet and cook, swirling the pan until the butter smells nutty and turns into a toasty golden brown color. Swirling the pan ensures even cooking. Place the butter into a glass bowl and reserve. In a large bowl, mix all the dry ingredients. In a separate bowl whisk the eggs, sour cream and buttermilk. Whisk in the brown butter. Mix the wet ingredients into the dry ingredients until well combined. Place dollops of brown butter cornbread mixture on top of the ground beef chili, spreading gently until the ground beef layer is covered. Don’t worry if it doesn’t look perfect. Mine didn’t either (see photo below). Transfer the casserole to the oven and bake until golden brown. 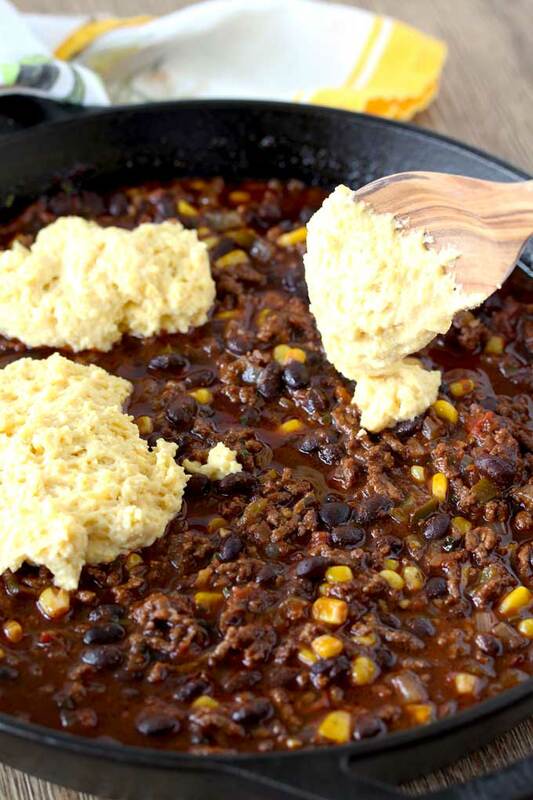 The flavors of the beef chili keep developing while the tamale pie bakes in the oven. The brown butter adds such a nice depths of flavor to the tender and light homemade cornbread. I mean seriously, I think brown butter makes everything better. You can make this recipe with ground turkey, ground chicken and even ground pork. 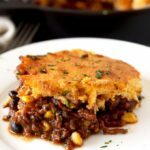 If you are a cheese lover, feel free to add some grated cheese on top of the ground beef chili before adding the cornbread layer. This is the perfect dish to serve at game night scooped into a bowl with some sour cream on the side. This recipe uses buttermilk. If you don’t have buttermilk at home, you can make it by adding 1/4 tablespoon of lemon juice or vinegar into a measuring cup. Top it with 1/4 cup milk and let it sit for 5 minutes. You can use homemade or store bought salsa for this recipe. Mild or medium heat work best. If you love spicy foods, feel free to add 1/4 + teaspoon of ground cayenne pepper or a small can of chopped green chilis to the filling! PIN IT TO YOUR DINNER OR COMFORT FOOD BOARD!! In a 12-inch cast iron skillet over medium heat, melt the butter. Continue to cook, swirling the pan occasionally to achieve even cooking. The butter will foam and then it will start to turn golden brown. Your brown butter is perfectly done when it has a nutty aroma and is toast-brown in color. Return the skillet to high heat and add the ground beef. Cook breaking up the meat with a wooden spoon. Cook for about 6 - 8 minutes or until browned. Add the onions, garlic and green peppers. Cook stirring frequently for about 4 minutes or until the vegetables softened. Add the cumin, chili, oregano, seasoned salt, clove and black pepper. Mix well. Turn the heat to medium and stir in the crushed tomatoes and salsa. Simmer for about 5 minutes. Add the beans, corn and chicken stock and simmer on medium low heat, stirring occasionally while you make the topping. Stir in the fresh cilantro if using and season to taste with salt and pepper. Remove from the heat. In a large bowl combine the cornmeal, flour, sugar, baking powder, and baking soda. In a separate bowl combine the eggs, sour cream and buttermilk, Whisk until all combined. Whisk in the brown butter. Mix the wet ingredients into the dry ingredients until well combined and smooth. Using a large spoon, place dollops of the cornbread batter mixture on top of the beef filling. With a spatula spread the batter into an even layer. Transfer the skillet into the oven and bake for about 20 minutes or until pale golden brown. You can test for doneness by inserting a skewer into the cornbread. If it comes out clean, is ready! Remove from the oven and let it cool for 10 minutes. Serve and enjoy! Eggs? You mention eggs in the cornbread direction, but they’re missing from the ingredients list. Thank you for pointing that out!! Thank you, ma’am. I was a professional editor/proofreader for 40 years and I know that something always slips by, especially when it can pop up in the most embarrassing spot possible. The recipe looks great, and I have my shopping list ready for tomorrow. You have been on the filed and know how easy it is to miss something! Hope you enjoy the tamale pie as much as we do!! Thanks again!!! Okay – my partner got back from her weekend with her kids and grandkids, so it was time for me to cook or clean up the pot. What an amazing recipe – tastes even better than it looks, and it looks magnificent. This is a great find – I’m an American with a French partner and we live in Germany, so sometimes substitutions for specialized ingredients can be a problem. 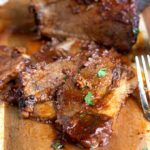 Not this time – all the ingredients are readily available and, following this recipe exactly, combine for a lip-smacking meal (well, for us, three meals). The only substitution I made was a Corning casserole dish for the 12-inch cast-iron skillet. I brought a 9-inch skillet with me from the States, and it’s a rarity here. Thanks! Glade you didn’t dismiss it! 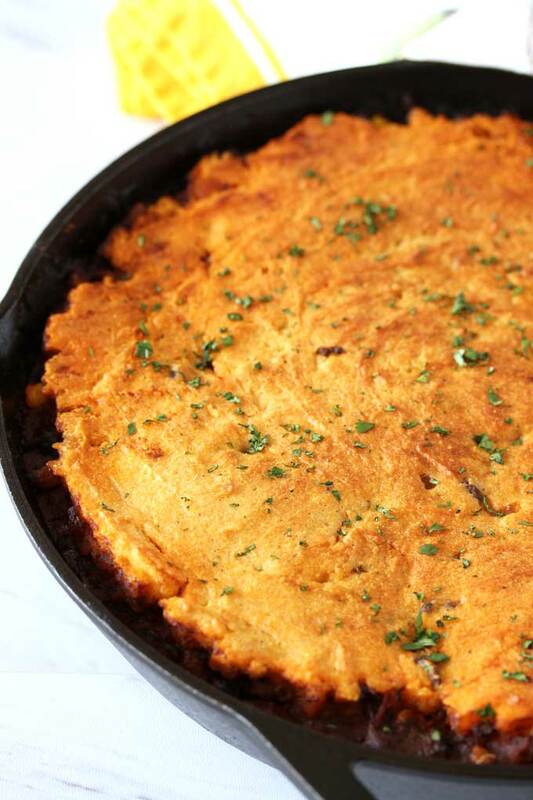 Yes, it can be made in any baking dish or oven safe skillet! Happy New Year! hope is a blessed and delicious one. We made this for dinner and it was simply amazing! Every single person had seconds and the only bad thing about the whole recipe was there wasnt even one bite left for lunch the next day! Next time Im going to make a double batch becasue we all wanted to have some for lunch the next day!